Some of us missed the actual Draw A Bird Day on April 8th and decided to celebrate it again on May 8, and on the eighth of every month. Well, I think I was all birded out last May 8, lol. Did I draw birds all week that week? Maybe. I still love them, but I’m not sure I’ve drawn one since! So I’m posting one I drew and painted that week in my journal. It never made it to the blog, as it was rather…..out of proportion. So I decided to call it pregnant. hehe. Hmm, and I’m pretty sure it’s a male too, so…..haha. 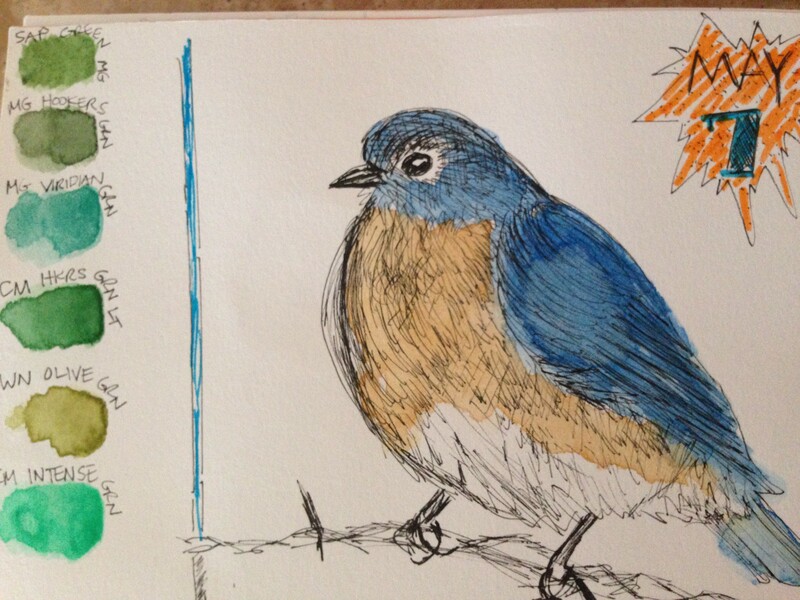 Does anyone want to carry on with Draw a Bird Day on the 8th of every month? I may join in, but can’t promise it! Definitely will do it next April though. This one’s for you, Kirkistan. Peace and a soaring wind to all! I am planning which bird to draw this evening. I like your bluebird very much. dang I have been so busy I forgot. I love your bird! Oh wait, that’s today. I can draw a bird later 🙂 see, busy! I don’t blame you a bit, Jill. I may not draw a bird for a year if I was you! The whole thing was done with Micron pen and I think the color was my actual wc tube paint. Boy, my memory is bad, it’s only been a month ago, lol. I’m glad you like my pregnant birdie. hehe. I’ve drawn a bird just in time – about to post it. I also missed the official draw a bird day in April and didn’t realise you were planning on carrying on every month. Birds are awesome so I’ll try and join in again on July 8th. I hope you do, Nicola! Birds are awesome. Maybe by then, I’ll be in the mood to do a new birdie. Beautiful! I really like that bluebird! Oh, gosh, I completely forgot about it today AGAIN! I meant to do it this month. Nice colors on the bird even if the proportions might be off! Nice birdie! A cat would look at him and think “omg super tender feast” though. He’d best keep an eye out. Ha, I can understand feeling birded out. I want to stick to the resolution, but this month I did a doodle page that, while it definitely has some birds (one of which is quite prominent), also has a lot of other stuff. Thanks! I used to do portraits too, and I got portrait-ed out, also. I may do another one soon but it’s been over two months since I last did one, I think. I go through subject spurts lol. Trying to figure out what my “thing” is. Who knows. How did you make the birdy emoticon? I think your bluebird is fluffing up for warmth and all the fluffing went to its belly. It could happen! It is super cute :-). The colours are great and I really dig it when you use ink. I’m going to keep trying for once a month bird drawings. Life happens, so sometimes, like this time, I may be late. Thanks! I’m glad you like him. And that you want to keep drawing every month is fantastic! I missed draw a bird day, but I have a bird in mind…maybe tomorrow? I like the tradition, we should keep trying. Your bluebird may have eaten a bit too much for lunch, but what a great face. Lol indigestion? Love it, thanks! I keep missing this, but I will put it on my calendar for next month! So darn cute! We’ve not seen a single bluebird this year, but our trees are full of robin’s nests and sweet cardinals.